“Rework and reimagine,” is how the Bretford Manufacturing website describes this 200-plus-employee Franklin Park, IL, fabricating and assembly company, which builds education-based mobile carts and furniture in its 325,000-sq.-ft. manufacturing operation, and delivers these products worldwide. The description is on point, as the company constantly develops new, technologically advanced offerings—years ago it was reportedly the first to offer mobile computer carts, the first to build a comprehensive line of audio/visual accessories and the first to launch a power-managing cart that conserves laptop battery life. Pushing the envelope not only applies to what Bretford sends out the door, but also to the equipment and processes it brings in. The third-generation, family-owned company performs forming, bending and stamping of typically hot- and cold-rolled mild steel, followed by welding, painting and assembly, all inhouse. Highly automated shop-floor production equipment—arranged in cells—includes press brakes, laser cutters for sheet and tube, punching and bending machines, and robotic welders. Since its inception in 1948, Bretford—the company name combines the founders’ wives’ maiden names—has relied heavily on press-brake operations, but more recently embraced automated bending to augment these capabilities. In 2013, the company purchased a P4 automatic panel bender from Salvagnini. An example of handiwork via Bretford Manufacturing’s automatic panel bender: The equipment replaces press brakes and provides a significant increase in productivity, report company officials. 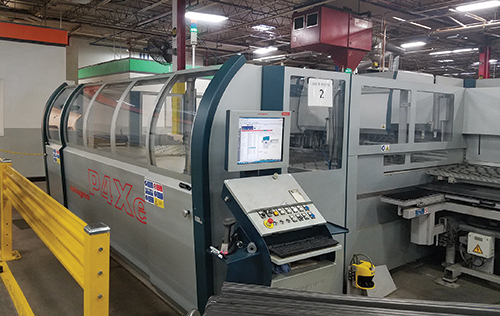 “The need to improve quality and efficiency drove this purchase,” explains Raddatz, seeing the equipment as an investment in the company’s lean efforts. 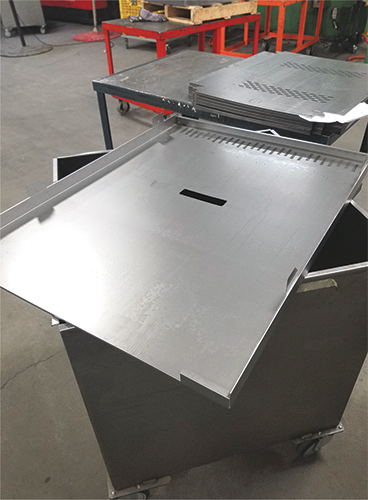 The P4 produces prototypes for Bretford, and the company designs parts, including side panels, bases and tops, specifically for production in the panel bender. “We optimize some of the dimensions and offsets for the P4, and our engineers are familiar with its capabilities,” says Paul Santaromana, who programs the panel bender at Bretford. The company routes 20- to 14-gauge material to 48 in. wide by 98 in. long through the machine, which also features automatic blank loading and part unloading. Maintenance-management software provides alerts for updates or filter changes, and Salvagnini has a remote connection to the machine, which helps ensure continued performance and optimum uptime. Running 20 hr./day during the busy summer season, the reliable P4 has streamlined panel-bending operations. Santaromana is quick to agree. Engineers at Bretford Manufacturing, familiar with the automatic panel bender’s capabilities, design parts and products specifically for this equipment. In a manufacturing cell, the P4 replaced two existing press brakes, which were transferred to handle sheet from a coil-fed laser-cutting machine. Raddatz stresses that productivity savings through the P4 addition have freed up employees for other operations at Bretford. In getting the P4 up and running, Bretford provided to Salvagnini a list of parts, many being difficult to form on the press brakes, to see which ones would be ideal for running through the new machine. “About 70 percent of those parts could be run with no issue,” Santaromana recalls. In any case, when programming the panel bender, computerized simulation ensures an ideal process. “I just fine-tune within our typical tolerance of 0.015 in. and the job is good to go,” he says. Bringing in this panel-bending technology fits nicely with Bretford’s lean quest—a big reason why the company can meet its target of a five-day lead time to the customer. That said, Bretford kanbans its inventory, with some parts premade and pulled as needed. 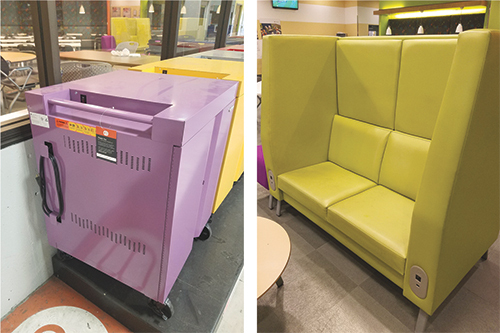 Primarily for educational settings, Bretford Manufacturing constantly debuts new products, including mobile charging carts for iPads (top) and furniture with built-in charging stations. 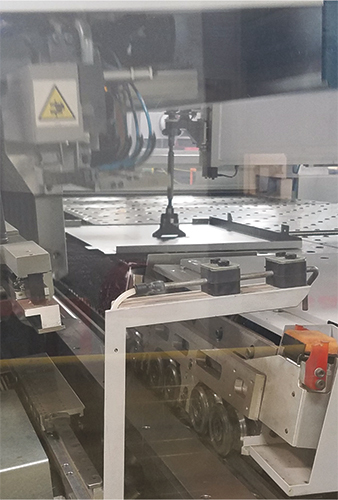 Joining the P4 and coil-fed laser cutter on the production floor are two laser-cutter/turret-punch-press combos—six press brakes are dedicated to output from the coil-fed unit, and six to the combos. From there, parts go to electrical, assembly and the paint line. Bretford also produces its own electrical units…and again, ‘not sitting around’ is the theme. During MetalForming’s tour of Bretford, Raddatz and Santaromana detailed the equipment and operations with obvious pride, which is no accident, as the company has worked hard (and successfully) to rework operations and, just as it claims, reimagine its product line and processes.